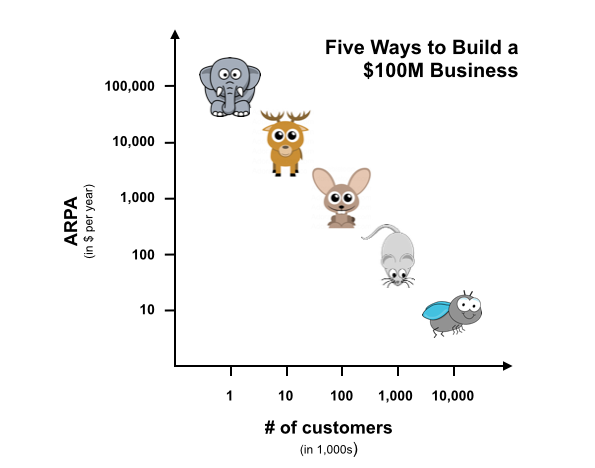 Some time ago my friend (and co-investor in Clio, Jobber and Unbounce) Boris Wertz wrote a great blog post about "the only 2 ways to build a $100 million business". I'd like to expand on the topic and suggest that there are five ways to build a $100 million Internet company. This doesn't mean that I disagree with Boris' article. I think our views are pretty similar, and for the most part "my" five ways are just a slightly different and more granular look at Boris' two ways. Salespeople sometimes refer to "elephants", "deers" and "rabbits" when they talk about the first three categories of customers. To extend the metaphor to the 4th and 5th type of customer, let's call them "mice" and "flies". So how can you hunt 1,000 elephants, 10,000 deers, 100,000 rabbits, 1,000,000 mice or 10,000,000 flies? Let's take a look at it in reverse order. In order to get to 10 million active users you need roughly 100 million people who download your app or use your website. This is of course a gross simplification, and the precise number depends on various factors like your conversion rate, how active your users are, churn, etc. But it doesn't change the take-away: To get to $100 million in ad revenues, you need dozens of millions of users. I know of only two ways to achieve that (plus one mega-outlier which breaks all rules, Google). The first one is to have a product that is inherently social and has a high viral coefficient (Instagram, Snapchat, WhatsApp). The second one is a ton of UGC (user-generated content), which leads to large amounts of SEO traffic and some level of virality. Good examples of this second option include Yelp or our portfolio company Brainly. To acquire one million consumers or prosumers who pay you roughly $100 per year, you need to get at least 10-20 million people to try your application. This is – again – a gross simplification, but I believe it's order-of-magnitude correct. To get to 10-20 million users you almost certainly need some level of virality, too – maybe not Snapchat-like virality, but some social sharing or "powered by"-virality. Great examples of this category include Evernote and MailChimp. If you're an eCommerce business you might be able to acquire one million customers using paid marketing, but it requires huge amounts of funding. Most SaaS companies that target small businesses charge something around $50-100 per month, so their ARPA per year is around $1k. To acquire 100,000 of these businesses you need something in the order of 0.5-2 million trial signups, depending on your conversion rate. Let's assume that your CLTV (customer lifetime value) is $2,700 (assuming an average customer lifetime of three years and a gross margin of 90%) and that you want your CLTV to be 4x your CACs (customer acquisition costs). In that case you can spend $675 to acquire a customer. If your signup-to-paying conversion rate is 10% that means you can spend $67.50 per signup (assuming a no-touch sales model where your CACs can go entirely into lead generation). So how can you get one million signups for less than $70 each? Most SaaS products aren't inherently viral, there usually isn't enough inventory to make paid advertising work at scale, and cold calling usually doesn't work at this ARPA level. There's no silver bullet, but the closest thing to a silver bullet is inbound marketing – besides having a fantastic product with a very high NPS (net promoter score) and being obsessively focused on funnel optimization. I've written about this in more detail in my "DOs for SaaS startups" series: Create an awesome product, Make your website your best marketing person, Fill the funnel, Build a repeatable sales process. Another option is a an OEM strategy (i.e. getting your product distributed by big partners), which can work but comes with its own challenges. Interestingly, hunting rabbits looks much less straightforward than hunting flies or hunting elephants. Why we have a strong focus on rabbit hunting SaaS companies nonetheless is something for another post. If you're a deer hunter and want to acquire 10,000 customers paying you $10k per year each, most of the rabbit hunting tactics still apply. An ARPA of $10k per year usually isn't enough to make traditional enterprise field sales work, and you likely still have to get 100,000 or more leads. The main difference is that when you're hunting deers you can use an inside sales force to close leads, potentially also to generate leads. It also means that you can pay VARs and channel partners an attractive commission, although I've rarely seen this work in SaaS. SaaS companies sometimes start as rabbit hunters and expand into deer hunting over time. This can work very well and we're very excited about these types of businesses, but to successfully execute this strategy, SaaS founders with a product/tech/marketing DNA usually have to bring in an experienced VP of Sales who has built an inside sales organization before. Like it or not, most of the biggest SaaS companies derive most of their revenues from selling expensive subscriptions to large enterprises. Workday, Veeva, SuccessFactors, Salesforce.com, you name it. Jason M. Lemkin, another friend and co-investor, once said (I'm quoting from memory) that if you have a good solution for a significant problem experienced by large enterprises, building a $100 million business is relatively straightforward. After all, you only need 1,000 customers, and the $100k you need from each of them is less than they spend on the salary of one executive. I think there's a lot of truth in that. The other part of the truth, though, is that it may take you several years and millions of dollars to find out if you really are solving a problem (a.k.a. product/market fit), and once you're at that point, you still need tens of millions of dollars or more to finance the enterprise sales cycle. This does not at all mean that elephant hunting isn't attractive. It just requires very different skills, which usually means a founder team with enterprise sales DNA. That leaves me with the million dollar – sorry, one hundred million dollar – question: Which other ways to build a $100 million business are there that I've overlooked? Let me know! * If you have $100 million in annual high-margin revenue, you will likely be able to exit for $500 million to $1 billion or more. That's the kind of exit most venture capitalists are looking for, although we as a small fund can achieve a great fund performance with somewhat lower outcomes. ** For eCommerce companies, which naturally have a much lower contribution margin than purely digital businesses like SaaS and are therefore valued at much lower revenue multiples, it makes more sense to target $100M in contribution margin. Great post Christoph! The numbers put many things into perspective. I wonder how many software companies targeting small businesses have reached the 100k customers mark. That would imply reaching 0,05% of all businesses globally. It may seem like not much, but it is harder than it sounds. It would be great to see a brake up of all the software IPOs and how they fit into each category. My guess would be that most of the IPOd companies are hunting elephants. grubhub is a rabbit-deer-mouse hybird. It's ARRA is about $5000. They market to consumers and take a commision. 100 * $1M, which is more along the lines of Veeva. Great Blog Post! When scaling a market, the trick is to get the percentage of the market who will actually but correct. Do yo have any metrics which can help predict this? For instance is there are 100,000 potential companies in your market and a SaaS company has x% market penetration do you guess 1% or 10% of the market as customers when projecting a business? A couple others that are slight variations of your concepts are: The whale: 100 * $1M customers (Palantir??). And the other that I can think of is a simultaneous blend of enterprise/consumer pricing models. (Google/Facebook). Difficult question, also because you will likely expand your TAM over time. Peter Thiel argues that you should start with a *small* market, dominate it, then move into adjacent markets. Spot on. Maybe you could add marketplaces in "hunting mice"
Thanks, great post. I would like to challenge your thoughts about the rabbit category. At 675 usd CPA I think it is possible, in some circumstances, to have an inside sales team. The math is like this: at 5k/month a sales rep you need a productivity of around 8 closures per rep per month. They key is in actually selling paid subscriptions right away, the beauty of Saas (if you are confident about the quality of the product) is that it makes it a relatively low risk decision to jump on board. At cases, you could even offer a money back guarantee for the first couple of months. The variable obviously is retention but i obviously assume a setting where the 2.5% monthly churn you estimate is achieved. What do you think? Thanks, Stefano! It's a good question, and one that I'm thinking about a lot - how low can you go, can you make an inside sales machine work at much lower ARPAs. In your calculation, is the idea that the inside sales people generate their leads themselves (presumably by cold emailing/calling) or that leads are generated via marketing? In this case sales reps qualify leads through cold calling. Leads are generated from lists. The best scenario would obviously be to improve lead quality through automated prospecting and segmentation tools. I believe that increased availability of data and the use of predictive analysis can actually improve the effectiveness of purely outbound inside sales and lower the arpa threshold were this approach makes sense. The two aspects are quite interrelated and we are working with two companies in our portfolio on this. Great post! Thanks for that! Great article and a must read for anybody about to start a SaaS business. I was wondering what your thoughts are on a blended model? We are in the pet industry (a huge market but niche at the same time). Only 150K locations but 100M people in the US. We're taking the approach of, let's say, Flies on Deer's back. We can get to 15K locations that generate $300 ARPA and then make another $300 ARPA from the 3K consumers they serve. Besides the difficulty of serving two masters, what have you seen are the biggest challenges on approaches like this and do you have any examples of successes? I've been hard pressed to come up with a good example - which is worrying and exciting at the same time. Thanks! Can you elaborate a bit more on your model - what are you selling, and do you have to acquire the end consumers too or do they come via the stores/locations? It sounds a bit like a marketplace model where you have two acquire two types of customers. Agree, I don't know too many $100M rabbit hunters (Constant Contact, MailChimp, SurveyMonkey?). I will come with another point. I think before thinking about generating 100 millions. There are more rabbit hunters than I can think of right now! Almost every SEO SaaS falls into this category. Even now. Who's a good search contender today? Bing? The hardest parts are getting those customers and keeping them. When you are high functioning like me you can do almost anything in IT, but lack people and social skills. People and social skills are needed to market and use public relations to get those customers and you have to emotionally connect to them. You have to keep them satisfied or else they leave and go somewhere else. You have to let them know what needs your products and services meet, you have to find ways your product and services save them money and time. This is why 9 out of 10 startups fail, can't connect to people enough to get them as customers. In the case of SpaceX and other space ship companies they would hunt whales like NASA and ESA in order to use their rockets to launch satellites and take astronauts to the ISS. Maybe find other governments who want to launch satellites but lack the technology to make a good rocket. Amazon, eBay, any website that lets rabbits sell items on their website and then hit them with service fees. Some are even VPS hosting companies that sell VPS hosts to rabbits for their websites. Rabbits cannot afford to run their own bare metal web server and always go to the cloud or VPS for services because it is cheaper. Another one is Github that lets Rabbits pay for private source code tracking that only their employees can access. On topic, I thought it was interesting to see Facebook monetize WhatsApp users at $.06-.07, which is helpful to think through after reading this post. and UK. B2B and B2C lists in India, US and UK. Lead Generation in US and UK. communications Company offering b2b and b2c list services in India, USA and UK. database and lead generation providers in Bangalore, USA,UK and India. Any more thoughts/insights on this? Good post! Your blog is very informative. Last month I contacted with Adtrafficking.Net. They provided me quality Ad trafficking services. I increased my business with the help of this agency. Thanks for sharing with us such a wonderful blog. Discover the most powerful version of "you" and how you can make money from it. Find out how discovering you purpose unleashes entrepreneurship. Uncover your most viable business direction and identify the steps to make it happen. Discover confident and practical reasoning behind why your dream business is possible. Business opportunity with Indian Entrepreneur and startup Myhoardings . A well conceived article about building your business and giving novice entrepreneurs a chance to think about earning millions of dollars in revenue. The reference given to animals here in accordance to customers makes it a bit weird but otherwise the whole post is quite informative and interactive to read. I have seen a lot of people who engage in white collar jobs still struggling to settle their multiple monthly bills from their meagre salary while a young chap who has entrepreneur spirit is cruising off in comfort. 100kin47days is a website that will teach you how to make 100k money fast, providing you the entreprenurial secrets that you need to have for success.